AlDub's new McDonald's TVC for Chicken McSavers meal. The AlDub nation is raving about the latest AlDub McDonald’s TVC. It has been uploaded on Facebook on January 29th and the storyline reflects the reality of the AlDub love team. The McDo Philippines TVC is titled, “Ipagpatawad mo, minahal kita agad. #ALDUBKoTo”. The one and a half minute TVC start off with Maine Mendoza posing with two little girls dressed up as Yaya Dub. Everyone leaves her alone in the big theater as she sat on stage and started using her tablet. She smiles sweetly as she looks at a clip of the historical July 16, 2015 episode that started the AlDub phenomenon, and other memorable photos and videos of AlDub. Alden approaches her quietly and calls her name, Maine, softly. They look and smile at each other as they eat and share McDonald’s products. Alden moves closer to Maine and Maine leans on his shoulder. The camera zooms out, showing the couple from their back, a lone and small spotlight shining on them like a distant moon. All throughout the TVC, the song “Ipagpatawad Mo” served as the background. Its lyrics were in perfect sync with what’s happening between Maine and Alden on the TVC, serving as a dialogue for their unspoken thoughts. Ngunit parang sayo ayaw nang lumayo. Mukhang totohanan na ah! The latest #ALDUBKoTo TVC is here! Overload na sa kilig together with Chicken McSavers! It shows Alden driving through the city and seeing evidences of the popularity of Maine Mendoza. 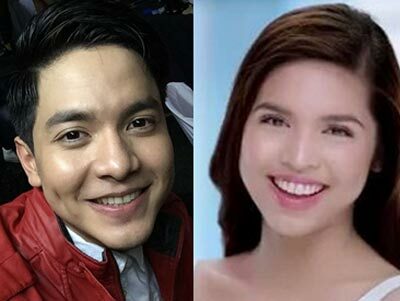 He smiles at a traffic enforcer making the pabebe wave, then he sees a family watching Maine on multiple TV screens, a jeepney with pictures of Maine on its body, and Maine’s McDonald’s billboard and standee. When he enters a theater, he passes by two little girls dancing animatedly in signature Yaya Dub aprons. Then Alden goes inside an empty theater, except for a lady sitting on the stage. Her face wasn’t shown but she was obviously Maine, using her tablet. She was unmindful of Alden, who quietly approached her from the back, carrying drinks and a food bag from McDonald’s. The TVC ended with Alden, smiling and almost whispering the name, “Maine”. That cliffhanger of an ending was enough for the AlDub fans wanting for more. The McDo TVC uploaded on January 14 had already gone viral, as is usually the case with AlDub’s TVCs, and had been viewed more than 5.5M times on Facebook. A lot of netizens have praised the quality of both McDo TVCs and say that they might as well be teasers for a teleserye or a movie. McDonald’s is the first company that came out with a TVC for AlDub. Back in those days, Maine was not allowed to use her own voice nor to see or meet Alden in person. But still, McDonald’s came out with a TVC that maximized the kilig factor of AlDub.